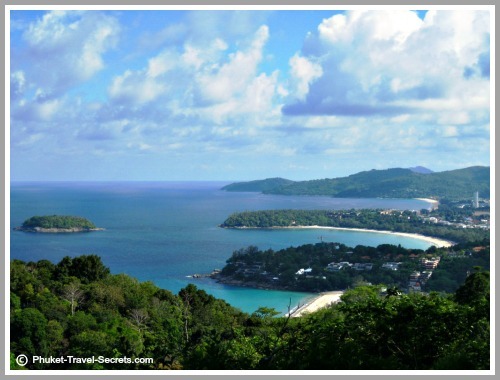 Below is a list of the best viewpoints in Phuket that we have found and would love to share. Karon - Kata viewpoint is also known in Thai as "Kho saam haad" meaning "Hill of the three beaches". 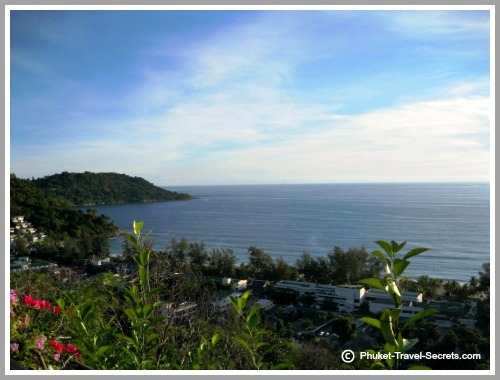 From the hilltop you have a beautiful view overlooking Kata Noi Beach, Kata Beach and Karon Beach as well as Pu Island. The bay nearest in view in the above picture is Kata Noi Beach, the next bay is Kata Beach and the last and longest bay is Karon Beach. The small Island you can see is called Pu Island. Kata Viewpoint is located along the road between Kata Beach and Nai Harn Beach, about a five minute drive south from Kata Beach on the way to Promthep Cape. On the road to the viewpoint there are reggae bars where you can have a drink and enjoy some of the best scenery. Once you arrive at the viewpoint you will find a small carpark and a large pavilion with seats, for you to enjoy the panoramic view. This viewpoint is one of the most famous images of Phuket. You will also find friendly vendors there selling food, drinks and souvenirs. This is one of our favorite Phuket viewpoints. Promthep Cape is also known as Laem Promthep, "Prom" is Thai for the Hindu term "Brahma", signifying purity and "Thep" means "God", according to local villagers they use to refer to the cape as "Laem Jao" or God's Cape. Promthep Cape is commonly known as Sunset Point, because of the spectacular sunset views. 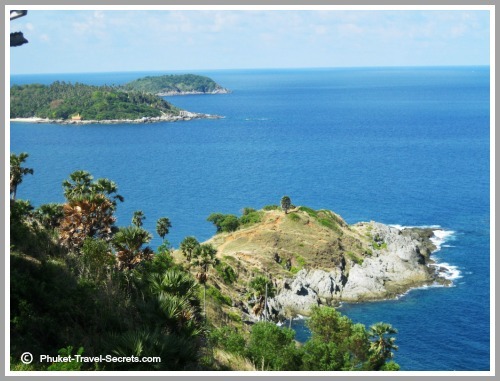 Promthep Cape is located at the southern most point of Phuket between Rawai and Nai Harn beaches offering some of the best views of the coastline. 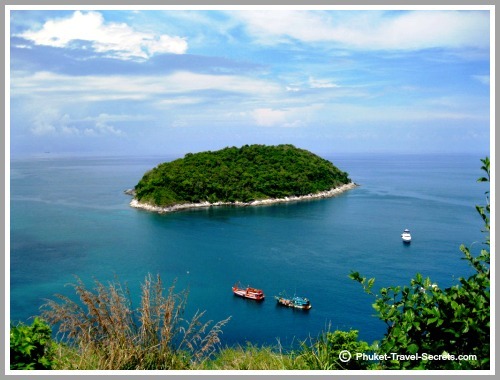 Early seafarers used Promthep Cape as a landmark for traveling up the Malay Peninsula. Many tour groups come here from late in the afternoon until sunset and is one of the most photographed and best known Phuket viewpoints. To the North you have some of the best views across Nai Harn Beach to the Royal Phuket Yacht Club and to the South, views of the peninsula that juts out into the water. Beyond the cape you can see Koh Kaeo, it is truly one of the most spectacular Phuket viewpoints on the Island. Also located at Promthep Cape is a lighthouse, you are welcome to go inside the lighthouse and have a look around the museum. Then make your way upstairs to the outdoor viewing area, from here you will have a 360 degree panoramic view. You will be able to see some of the most spectacular views to the east and southeast across to Koh Phi Phi Islands, Koh Racha Noi and Koh Racha Yai in the distance. The Windmill Viewpoint is located between Yanui and Nai Harn Beaches, not far from Promthep Cape. The Windmill viewpoint is not as busy as Promthep Cape but the views are absolutely breathtaking. 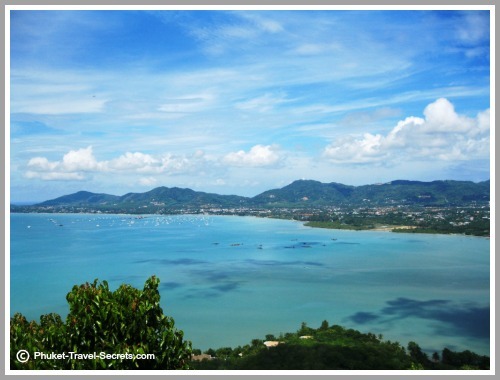 Khao Khad Viewpoint is located on top of the hill in the middle of Cape Panwa, in the south east corner of Phuket. 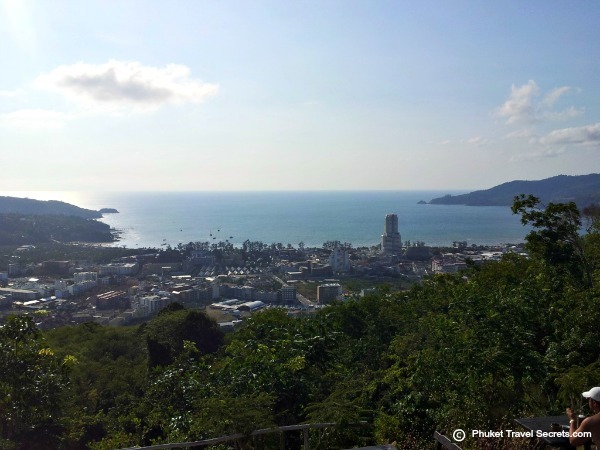 Khao Khad viewpoint is a little harder to find but it is one of those Phuket viewpoints that should not be missed. Just follow the signs to the Novotel then follow the signs to Khao Khad view tower. The Khao Khad viewing tower was established by the Witchit District Government Organization. 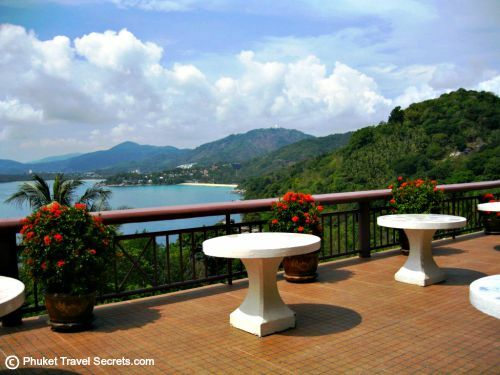 There are stairs leading up to the top of the hill where there is a two level viewing tower offering the best 360 degree panoramic views of the Southern Region of Phuket. To the South lies Chalong Bay, North across Phuket Town, to the east is Makham Bay, Cape Panwa and surrounding Islands, and to the West is Koh Sirey. The views are simply stunning.. 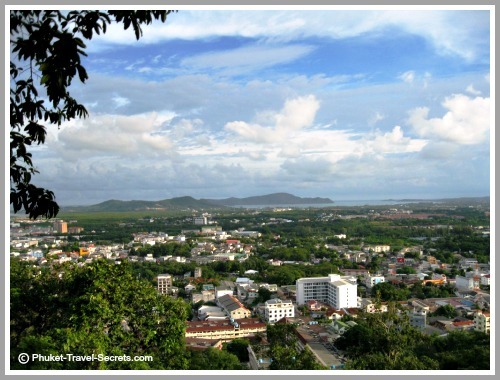 Rang Hill Viewpoint is located in Phuket Town and is very popular with both tourists and locals, offering some of the best views across Phuket Town, the Southern Region of Phuket and the offshore Islands. At the to of Rang Hill you will also find an exercise park for those that wish to do a workout. If you are in need of some refreshments there is a café located halfway up the hill or the Tunk Ka café at the top with great views and delicious food. Big Buddha is one of our favorite Phuket viewpoints, located on top of Nakkerd Hill at an altitude of 350 metres. Big Buddha's proper name is Prahputtamingmongkol Eaknakakeeree. Not only is the Big Buddha something to be seen, the 360 degree panoramic views from up here are absolutely stunning. Big Buddha is the biggest Buddha Image in Thailand standing at 45 metres high, and 25 metres across the base. The statue is in the "Mara Vichaya posture" meaning "Buddha conquering the demons". 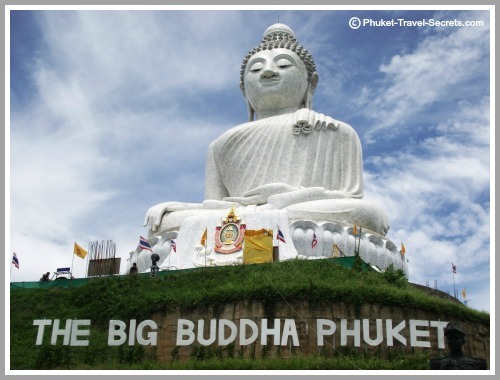 The Big Buddha is layered with white marble, you can easily see the Big Buddha from most areas in southern Phuket. 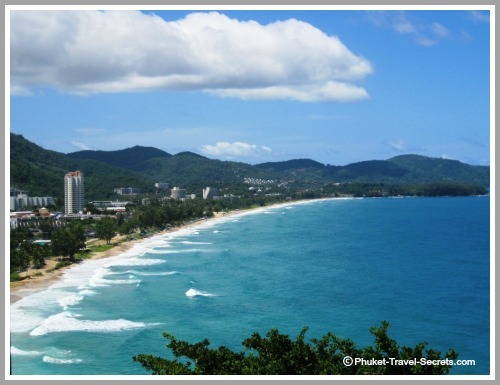 If you are staying at Karon, look to the hills behind the beach and you will easily see it. There is also a smaller brass Buddha image which stands at 12 metres high that sits along side the Big Buddha. When visiting Big Buddha you will need to dress appropriately. 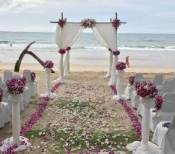 There are sarongs that you can use from the site centre free of charge to cover up if you need to. Big Buddha is fast becoming one of most popular tourist attractions in Phuket, partly because of the amazing views from the top of the hill. To get to Big Buddha and one of the best Phuket Viewpoints you will find the road leading up the hill between Wat Chalong and Chalong Circle, just follow the red and white signs to the Big Buddha. Opening hours are from 8.00 - 19.30. See our video of Big Buddha below. There is no designated viewpoint at Kata Noi, however there are several restaurants and bars located high on the hill overlooking Kata Noi. These restaurants and bars are an excellent spot to sit back, relax and enjoy the views. Sabai Corner is one of our favourite viewpoint restaurants. This view overlooking Karon Beach is not a designated viewpoint. However if you would like to see these views of Karon Beach call into the Baan Karon Hill Resort and Restaurant to enjoy the views. For the best views of Patong Bay, make your way up to Wassa Homemade Bar in the hills at the back of Patong. We will be adding more Phuket viewpoints in the no so distant future so pop back here from time to time to see the updates.